A military discharge is given when a member of the armed forces is released from his or her obligation to serve. Each country's military has different types of discharge. They are generally based on whether the person completed their training and then fully and satisfactorily completed their term of service. Other types of discharge are based on factors such as the quality of the person's service, whether their service had to be ended prematurely due to humanitarian or medical reasons, whether the person had been found to have drug or alcohol dependency issues and whether they were complying with treatment and counseling, or whether the person had demerits or punishments for infractions or were convicted of any crimes. These factors affect whether they will be asked or allowed to re-enlist and whether they qualify for benefits after their discharge. There are several reasons why someone may be discharged from the military, including expiration of enlistment, disability, dependency and hardship. Members of the British Armed Forces are to complete their service obligations before they may be considered for discharge. Service personnel who attempt to leave before completing their length of service, without going through the appropriate channels, may be subject to criminal conviction. At the end of service in the Regular Forces, personnel normally have a compulsory reserve liability. The length of this liability depends on the Service, rank and type of commission or engagement in which they entered and whether they are subject to the Reserve Forces Act 1980 or 1996. Normal Service Leaver: personnel who A) are leaving on completion of engagement; B) have been given notice to leave, or C) been given notice of discharge under redundancy. Early Service Leaver: personnel who have been discharged either A) compulsorily from the trained or untrained strength, or B) at his/her own request from the trained strength or untrained strength having completed less than 4 years of service. Medical Discharge / Retirement: service is being terminated on medical grounds. Personnel would have attended a Medical Board that recommended the person's services be terminated on medical grounds. Individuals in the Royal Navy and Royal Marines who are not due for compulsory retirement but who wish to leave the Service, for whatever reason, before reaching the end of their Commission/Career/Engagement may apply for Early Termination, provided the conditions outlined in Chapter 54 of BR 3 - Naval Personnel Management are met. Within the Naval Service, the term "retirement" applies to officers who complete the period of service required by their respective commissions. For officers of the trained strength, recommendations for termination of a commission must generally be reviewed by the Admiralty Board. Early Termination: Officers may apply to leave (voluntarily withdraw from training) up until their Premature Termination of Career Training (PTCT) point, which is generally before the day they pass out of Britannia Royal Naval College, and also depends on their speciality. Ratings and Other Ranks have a "statutory right of discharge" after six months' service or after they turn 18. Invaliding: Personnel may be "invalided out" if they are found "permanently unfit for full naval service" by the Naval Service Medical Board of Survey (NSMBOS). Resignation: This is a common civilian term used to refer to the termination of one's commission but in the Naval Service, the term "resignation" has a "special meaning". Despite common usage of the term, officers do not legally have the right to resign their commission. However, they may be permitted to do so under extenuating circumstances, at the discretion of their CO and with permission from the Admiralty Board. Resignation is appropriate when an officer wishes to sever all connection with the Service. Circumstances that would warrant resignation rather than the other types of discharge are where an individual holds actions or beliefs/attitudes that fundamentally conflict with the concept of military service. The primary consideration of the Admiralty Board's acceptance of resignation is the best interests of the Service. Officers who resign their commissions are not liable to serve in the Reserves but certain benefits such as retired pay and resettlement grant may be affected. Compulsory Withdrawal from Training (CWFT): When an officer's performance – whether professional, character or leadership – falls below the standard required, even after all appropriate warnings have been applied, this type of discharge may be invoked. Young Officers (YO) (officers in training) at the Britannia Royal Naval College or Commando Training Centre Royal Marines and Officer Candidates promoted from the Lower Deck who fail to complete initial training can also be subjected to a CWFT. Pilots undergoing professional training would be suspended from flying duties. Administrative Discharge: Officers whose performance or conduct falls below the standard required may be discharged from the Active List. Unsuitability Due to Causes within the Officer's Control: service personnel (both officers and ratings) may be discharged on grounds of "temperamental unsuitability" (TU). The RN BR3 handbook defines TU as "a persistent and obvious failure by the individual to adapt to the basic, but unique demands of Service life". Dismissal: Officers charged with offences under the Military Discipline Legislation. In exceptional cases, officers may be "dismissed with disgrace". Compassionate discharge: There are several types of compassionate discharges. Such a discharge is granted for Ratings who seek a discharge due to extenuating personal circumstances. In the U.S., discharge or separation is not retirement. Enlisting in the US military generally entails an eight year commitment, served with a combination of active and reserve service. Individuals who voluntarily separate from active duty with fewer than eight years normally fulfill the balance of their term in the Individual Ready Reserve (IRR). Personnel who serve for 20 years or longer are not discharged. These members retire and are transferred to the Retired Reserve. Members who are seriously disabled are also retired, referred to a Medical Retirement, rather than discharged. If discharged administratively for any of the above reasons, the service member normally receives an honorable or a general (under honorable conditions) discharge. If misconduct is involved the service member may receive an Other Than Honorable (OTH) Discharge service characterization. To receive an honorable discharge, a service member must have received a rating from good to excellent for his or her service. Service members who meet or exceed the required standards of duty performance and personal conduct, and who complete their tours of duty, normally receive honorable discharges. A dishonorable discharge (DD) is handed down for an offense the military considers the most reprehensible conduct. This type of discharge may be rendered only by conviction at a general court-martial for serious offenses (e.g., desertion, sexual assault, murder, etc.) that call for dishonorable discharge as part of the sentence. Career U.S. military members who retire are not separated or discharged. Upon retirement, officers and enlisted personnel are transferred to the Retired Reserve. Until they reach age 60, they are subject to recall to active duty by order of the president. In addition, a military member who becomes disabled due to an injury or illness is medically retired if: 1) The member is determined to be unfit "... to perform duties of the member's office, grade, rank or rating ..."; 2) Whose disability is determined to be permanent and stable; 3) Is either rated at a minimum of 30% disabled, or the member has 20 years of military service. Medical retirees are transferred to the Retired Reserve with the same retired pay and benefits as 20+ year retirees. Medically retired personnel are not subject to recall to active duty. Entry level separations, or uncharacterized discharge, are given to individuals who separate prior to completing 180 days of military service, or when discharge action was initiated prior to 180 days of service. This type of discharge does not attempt to characterize service as good or bad. However, this type of discharge often attaches a "reason" such as pregnancy, performance in training or medical issues. An individual with an ELS may, under certain conditions, be allowed to re-enlist in the military. 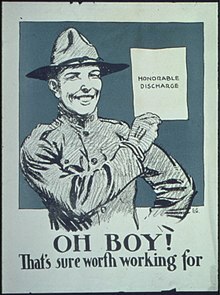 World War I poster depicting a soldier holding his honorable discharge. To receive an honorable discharge, a service member must have received a rating from good to excellent for his or her service. Service members who meet or exceed the required standards of duty performance and personal conduct, and who complete their tours of duty, normally receive honorable discharges. However, one need not complete a term of service to receive an honorable discharge, provided the reason for involuntary discharge is not due to misconduct. For instance, service members rendered physically or psychologically incapable of performing assigned duties normally have their service characterized as honorable, regardless of whether they incurred the condition or disability in the line of duty, provided they otherwise met or exceeded standards. Similarly, service members selected for involuntary discharge due to a Reduction in Force (RIF) typically receive an honorable discharge, assuming their conduct while on active duty met or exceeded standards. Individuals with honorable discharges may, under certain circumstances, be allowed to re-enter military service. AR 635-200, para 9–4. "Characterization of service or description of separation The service of Soldiers discharged under this section will be characterized as honorable or under honorable conditions unless the Soldier is in entry-level status and an uncharacterized description of service is required. An honorable discharge is mandated in any case in which the Government initially introduces into the final discharge process limited use evidence as defined by AR 600–85, paragraph 6–4. (See para 2–6h for procedures for reinitiation or rehearing, if appropriate.)" General discharges are given to service members whose performance is satisfactory but is marked by a considerable departure in duty performance and conduct expected of military members. Reasons for such a characterization of service vary, from medical discharges to misconduct, and are utilized by the unit commander as a means to correct unacceptable behavior prior to initiating discharge action (unless the reason is drug abuse, in which case discharge is mandatory). A commander must disclose the reasons for the discharge action in writing to the service member, and must explain reasons for recommending the service be characterized as General (Under Honorable Conditions). The service member is normally required to sign a statement acknowledging receipt and understanding of the notification of pending discharge memorandum. The person is also advised of the right to seek counsel and present supporting statements. In addition, service members are required to sign documents acknowledging that "substantial prejudice in civilian life" may be encountered under a general discharge. A general discharge may or may not preclude a veteran's participation in the GI Bill, service on veterans' commissions, and other programs for which an honorable discharge is required, but is eligible for VA disability and most other benefits. Illinois prohibits discrimination against a veteran from housing or employment on the basis of unfavorable discharge from military service per the Human Rights Act of 1970. This Illinois protection does not apply to lower types of discharge. An OTH is a form of administrative discharge. This type of discharge represents a departure from the conduct and performance expected of all military members. Recipients of OTH discharges are barred from reenlisting into any component of the Armed Forces including the Reserve and National Guard components. Generally, in order to receive VA benefits and services, the Veteran’s character of discharge or service must be under "other than dishonorable" conditions (e.g., honorable, under honorable conditions, general) as stated by VA policy. However, individuals receiving an other-than-honorable or bad conduct discharge may qualify for VA benefits depending on a "Character of Service Determination (CSD)" made by VA. If the veteran has either a service-connected injury or illness, at least two years of active-duty service, or has received at least one Honorable discharge they will be able to enroll in the VA health care system. The VA will submit Form 7131 (Information Exchange Between VA Regional Offices and Medical Facilities) and make a character of service determination to decide if their service was "Honorable (for VA purposes)", "Honorable (for medical purposes)", or "Dishonorable". Veterans with an OTH discharge who qualify for VA Healthcare are eligible to submit claims for disability compensation pay, participation in educational, volunteer, and vocational rehabilitation programs. Other Than Honorable recipients are eligible for Montgomery GI Bill benefits if they have completed at least one honorable discharge and may be eligible for Post 9/11 GI Bill Benefits if the VA determines their service to be "Honorable (for VA purposes)". By Presidential Proclamation 4313, President Ford created a procedure for those military personnel who resisted the Vietnam War to receive a Presidential Pardon and have their punitive discharges changed to a Clemency Discharge. It also provided a path for those who left the country to return. If the military personnel fulfilled certain requirements of alternative service, they would also receive a Certificate of Completion from the Selective Service System. Punitive discharges constitute conduct prejudicial to good order and discipline. A Bad Conduct Discharge (BCD) can only be given by a court-martial (either special or general) as punishment to an enlisted service-member. Bad conduct discharges are often preceded by a period of confinement in a military prison. The discharge itself is not executed until completion of both confinement and the appellate review process. Virtually all veterans' benefits are forfeited by a Bad Conduct Discharge; BCD recipients are not eligible for VA disability compensation in accordance with 38 CFR 3.12. A dishonorable discharge (DD) can only be handed down to a military member by a general court-martial. Dishonorable discharges are handed down for what the military considers the most reprehensible conduct. This type of discharge may be rendered only by conviction at a general court-martial for very serious offenses (e.g., treason, espionage, desertion, sexual assault, murder) that call for dishonorable discharge as part of the sentence. With this characterization of service, all veterans' benefits are lost, regardless of any past honorable service, and this type of discharge is regarded as shameful in the military. In many states a dishonorable discharge is deemed the equivalent of a felony conviction, with attendant loss of civil rights. Additionally, US federal law prohibits possession of firearms by those who have been dishonorably discharged per the Gun Control Act of 1968, and being dishonorably discharged is as well a disqualifying question on the Form 4473, which must be completed and signed to purchase a firearm from a Federal Firearms Licensee (FFL) and will result in a denial by the Brady background check that must be performed and passed to allow a sale. According to the Department of Defense, of 207,000 service members that were discharged in 2014, more than 18,000 (9%) were issued less-than-honorable paperwork, including 4,143 (2.0%) other-than-honorable discharges, 637 (0.31%) bad conduct discharges, and 157 (0.08%) dishonorable discharges. After 2000, 352,000 people were handed similar papers ranging from general discharge to bad conduct and dishonorable discharge. If a court-martial convicts an officer but imposes a sentence that does not include a dismissal, the secretary of the officer's service branch may drop that officer from the roll (official list) of officers in that branch. Such a separation is characterized as administrative rather than punitive. After discharge, a service member (or his or her next-of-kin, if the service member is deceased) can appeal the type of discharge that was given. The member must file form DD-293 if discharged within 15 years, or form DD-149 if over 15 years ago. The forms are significantly different and go to different places.[where?] 10 U.S.C. §§ 1552–1553 provide the law for this action. The service member (or his or her next of kin if the service member is deceased) must submit evidence for error, impropriety or inequity in discharge. Most requests are rejected, with a change authorized only if it can be proved the service member was unfairly denied an honorable characterization. Any punitive discharge adjudged by a Court-Martial is automatically reviewed by a military appellate court for each respective branch. These are the Army Court of Criminal Appeals (ACCA), Air Force Court of Criminal Appeals (AFCCA), Navy-Marine Corps Court of Criminal Appeals (NMCCCA), and the Coast Guard Court of Criminal Appeals (CGCCA). These courts are staffed by appellate military judges and function as an intermediate appellate court and have the power to review de novo both any questions of legal error and the factual basis of the conviction. If either the government or the accused is dissatisfied with the results of this appeal, the conviction or the sentence can be appealed to the Court of Appeals for the Armed Forces (CAAF). This court has the power of discretionary review, in that it can in some cases deny a petition to grant a review. This court however must hear any death penalty cases or cases certified by the Judge Advocate General of each respective service for appellate review. Litigants before the CAAF can appeal to the United States Supreme Court. However, this right only applies to any case that the CAAF has reviewed. Therefore, in most military justice cases, the CAAF is the court of last resort since a denial of a petition of review by that court prevents higher appeal. Servicemembers who are given a punitive discharge and have completed any adjudged confinement are normally placed on appellate leave pending final review of their cases by the appellate courts. This includes members who plead guilty at their courts-martial since all cases are automatically reviewed. The member is considered on active duty and is subject to the Uniform Code of Military Justice while on appellate leave. While the member is entitled to full health care benefits and other privileges of being on active duty, the member receives no pay or allowances and is relieved of any military duties. A service member who was adjudged a punitive discharge at a court martial and then dies before the appellate review process is complete is considered to have died on active duty under honorable conditions. His or her next-of-kin is then entitled to any rights and benefits to which any other service member's family would be entitled. 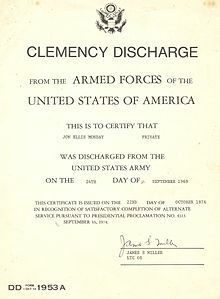 Once discharge is finalized, General, Entry-Level/Uncharacterized, and Under Other Than Honorable Conditions (UOTHC or OTH) discharges may be appealed for upgrade through the Discharge Review Board of the respective service; however, the appeal must be filed within 15 years of the date of separation, and it must be shown that the characterization of service was the result of an error or injustice. Bad Conduct Discharges handed down by a Special Court-Martial may be upgraded only as an act of clemency. Discharge Review Boards may also consider appeals for a change to the Narrative Reason for Discharge (in Block 28 of DD 214). The DRB does not consider a request for the change of a Reenlistment Eligibility (RE) or Separation Designator (SPD) Code by itself, but they are often changed to correspond with the new characterization of service and/or narrative reason for discharge if a discharge is upgraded. If more than 15 years have passed since discharge, appeals must be directed to the Board For Correction of Military/Naval Records of the respective service. The BCM/NR hears a wide array of appeals and correction requests, and can be utilized by Active Duty, Reserve, National Guard, retired and discharged veterans alike. Normally, an appeal must be filed within three years of the occurrence of an error or injustice; however, exceptions are often made. In the United States, every service member who is discharged or released from active duty is issued a DD Form 214 and a military discharge certificate (denoting the discharge type, such as Honorable). A reservist who is called to active duty is given a DD 214 when he or she is deactivated and returned to the reserves. Those who are discharged before completing 8 years of active duty or reserve duty in an active drilling status are transferred to the Individual Ready Reserve (IRR) for the remainder of their military service obligations (MSO). The Individual Ready Reserve does not drill or receive pay; however, a member in IRR status can be recalled to active duty during time of war or national emergency until the 8 years have expired. Most members separating with an honorable discharge after completing a single term of service (typically 3–6 years) are transferred to the IRR for the remainder of the 8-year MSO. Retirees are furnished with the DD 214, though a U.S. military retirement is not characterized as a discharge as retirees may be recalled to active duty, under certain circumstances, until they have achieved a total of 30 years of service. The DD 214 is a complete documentation of military service. It contains everything from total time in service, dates of entry and discharge, dates of rank, documentation of foreign service, ribbons, medals and badges awarded, professional military education completed, characterization of service, and reason for discharge (among other things). In responses to job applications, many employers request a copy of the DD 214. There are two DD 214 types: the edited (or "short") version, and the unedited (or "long") version. The edited version omits certain information, including the reason for discharge. Employers often request the unedited version, but the legality of this is debatable in certain situations. It can be denied, especially if the "long" version references facts that violate the right to privacy or could be used in a discriminatory fashion (such as non-relevant psychological, medical, or disability issues) explicitly cited as illegal by federal or state hiring laws. (for example, the Illinois' Human Rights Act prohibits discrimination due to unfavorable discharge) A service member may request the edited, unedited, or both versions on separation. Since the 1970s, an honorably discharged veteran receives a frameable certificate (DD 256). A similar one is issued to someone granted a general discharge (DD 257). For each certificate, one or more letters after the number indicate the branch of service that issued it. For example, a "256A" is awarded by the Army. Other certificates for long service, or to eligible spouses of veterans, may also be presented. The Freedom of Information Act has made (limited) records of military service available to the public, on request. However, information protected by the Privacy Act of 1974 can be released only with the veteran's consent. During wartime the American military have often issued special insignia to honorably discharged veterans to wear on their uniforms to distinguish them from local service personnel or deserters. The Army issued red Discharge Chevrons during and after World War One (1917-1919) that were worn point-up on the lower right sleeve of the tunic or overcoat. Just before and just after World War Two (September, 1939 - December, 1946) the Army issued the Honorable Discharge Insignia (or "Ruptured Duck"). It was an eagle in a circle badge sewn in yellow thread on an olive drab diamond that was worn over the right breast pocket on the "Class A" dress tunic. The Marine Corps issued an Honorable Discharge Lapel Button from 1916 to the present that was meant to be worn with civilian clothes. During World War Two from 1941 to 1945 a contrasting diamond worn on the lower right sleeve with the Dress Blues or Dress Whites (a white diamond on the Dress Blues and a blue diamond on the Dress Whites) by retired Marines. A white diamond was worn on the upper right shoulder (like a Distinctive Unit Insignia) on the Service Green or Service Khaki "Alphas" and the overcoat by discharged Marines. In 1945 the Navy and Marine Corps adopted the Army's "Ruptured Duck" insignia to handle the large number of discharged service people at the end of the war. Another important aspect is the RE (Reenlistment Eligibility) Code. This specifies under what conditions the member can reenlist in the armed forces. The definition of each RE Code may vary from Service to Service, as currently it is the responsibility of each branch of the Armed Forces to establish reenlistment eligibility criteria. As a general rule, however, an RE Code in the "1" series allows reenlistment into any component of the Armed Forces, and an RE Code in the "3" series usually lets the veteran reenlist with a waiver. RE Codes in the "2" series often place restrictions on reenlistment: this is especially true in the Air Force, which has a policy permanently barring airmen separated from the Air Force with an RE Code 2 from reenlisting in the Air Force (though reenlistment into other components of the Armed Forces may be possible with a waiver). An RE Code in the "4" series typically bars reenlistment into any component of the Armed Forces. (It is possible for a person with an RE Code of 4 to enlist in the Navy or Air Force if the SPD Code and the Narrative Reasoning is waivable.) A veteran issued an RE Code in the "4" series usually requires an Exception to Policy waiver to reenlist. The Department of Veterans Affairs uses different criteria than the Departments of the Air Force, Army, and Navy when establishing veteran status. VA benefits can sometimes be enjoyed if the veteran's service was under "other than dishonorable" conditions. An example of this would be the VA's health care and home loan programs. ^ "Advancement". Integrated Publishing. Archived from the original on 2 February 2012. Retrieved 17 February 2012. ^ "ForcesWatch brief - Terms of Service in the UK Armed Forces" (PDF). Parliament. ^ "Reserve Forces Act 1980". Parliament of the United Kingdom. ^ "A Welfare Guide for the Service Leaver - Transition to Civilian Life" (PDF). army.mod.uk. Archived from the original (PDF) on 2015-09-23. ^ "What is a Military Enlistment Contract?". Findlaw. Thomson Reuters. Retrieved 11 October 2017. ^ a b Absher, Jim. "Military Disability Retirement". Military.com. Military Advantage. Retrieved 11 October 2017. ^ AR 635-200 Active Duty Enlisted Administrative Separations. United States Army. 2016. p. 93. ^ Wilson, Emily. "Different types of military discharges explained". Eielson Air Force Base. Archived from the original on May 14, 2012. Retrieved 2016-09-02. ^ "Unlawful acts (18 U.S.C. §922(g)(6))". Retrieved 2012-03-26. ^ Jim Salter (December 24, 2015). "Some levels of military discharge can mean no benefits for former service members". U.S. News & World Report. Retrieved July 10, 2016. ^ TD ATF-391, 1997-3 A.T.F.Q.B 1. About.com Upgrading your discharge. Retrieved February 27, 2006. "BR3 - Chapter 54: Leaving the Service" (PDF). royalnavy.mod.uk. Archived from the original (PDF) on 2013-06-27. Military-Transition.org Additional resources to help service members and their families return to civilian life Retrieved June 18, 2018. This page was last edited on 22 April 2019, at 07:05 (UTC).